The first thing Ben wanted to do on the first weekend after his return from Beijing was to go shopping in Bellingham. He wanted to shop for some clothing. Ben does not like the men’s clothing in Beijing. Guess where we had lunch? 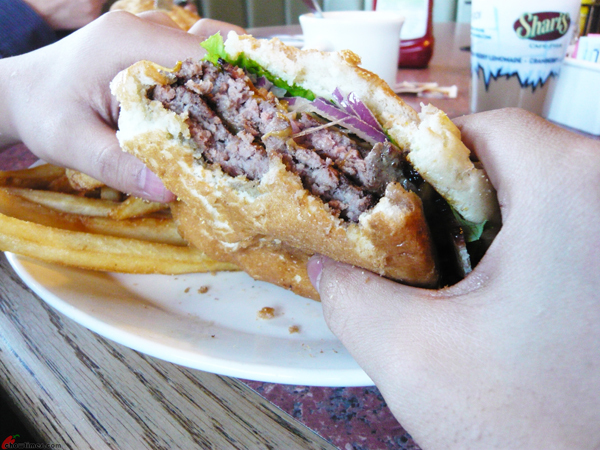 Ben was yearning for a good burger and we had lunch at Shari’s in Bellingham. 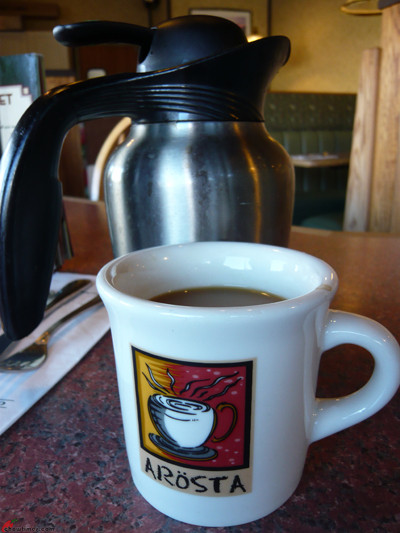 We had blogged about Shari’s in Bellingham here and Shari’s in Seattle here. 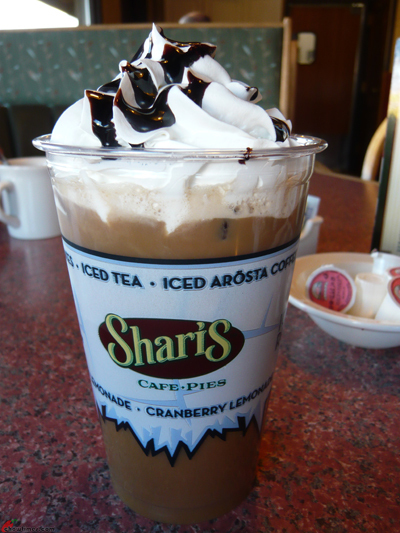 Shari’s is a chain restaurant that opens 24 hours. 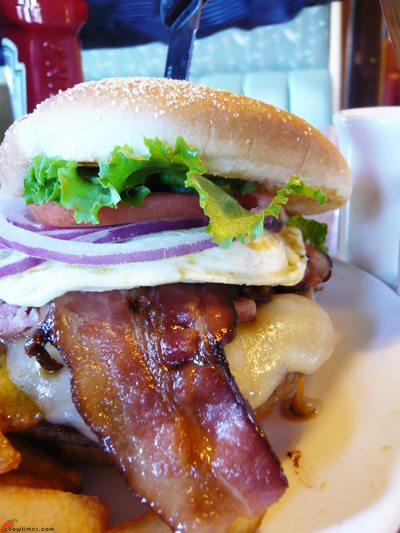 Ben ordered the Trail Boss which stacks high with ham, bacon, Swiss cheese and most important of all a fried egg. The fried egg is the reason Ben ordered this. 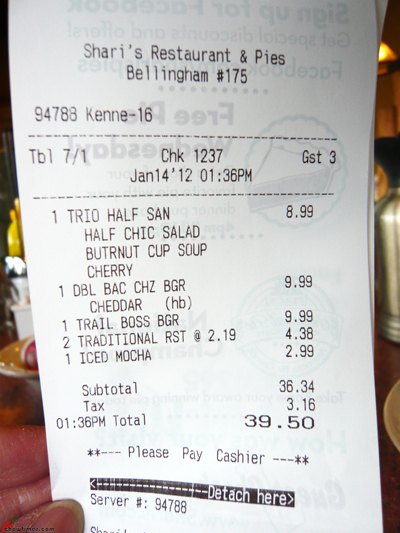 The Trail Boss is $9.99. It was impossible for Ben to eat the Trail Boss with his hands holding the burger up. So, he ate it like a gentleman with the fork and knife. 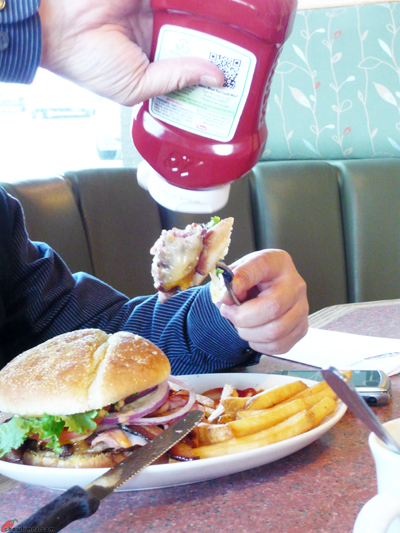 He loves to add ketchup to his burger and fries. Nanzaro ordered a Double R Ranch Double Stack Bacon Burger which is also $9.99. This is a 2-patty monsters. Unlike Ben, Nanzaro ate his burger like a cowboy. He squeezed the burger so hard that the buns actually broke up. For the burger, the server asked if Nanzaro wanted the meat pink. Nanzaro wanted his pink. 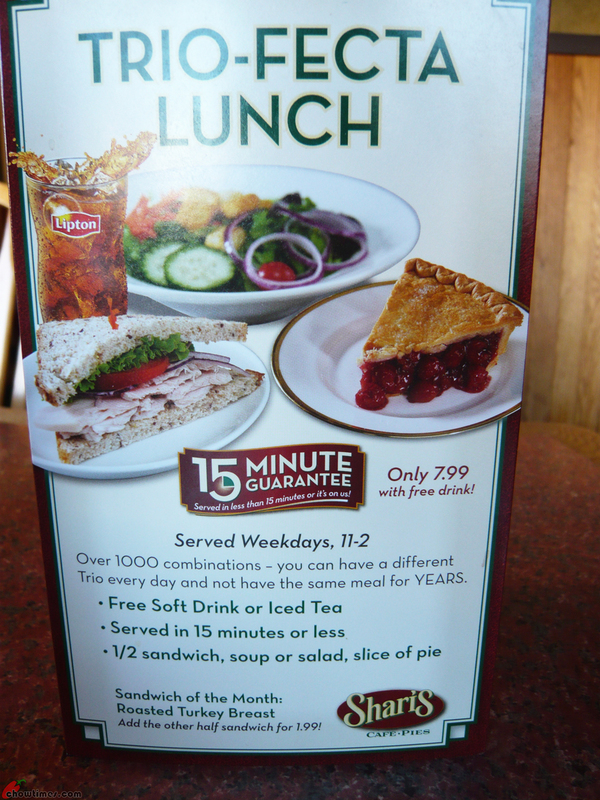 For me, I ordered a lighter meal of half a sandwich which comes with a soup or a salad and a piece of pie of your choice. I love smaller portion and more varieties. Mine meal was $8.99. There is a similar combo promotion during week day for only $7.99 which also includes a drink. It’s a much better deal. 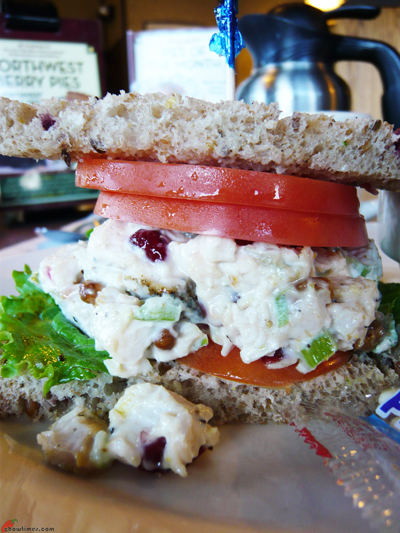 For the sandwich, I had cranberry whole wheat bread with cranberry pecan chicken. The bread was very dry and crumbly, otherwise the sandwich was ok. Oh! the extra two slices of tomatoes on the top were from Nanzaro’s burger. He does not like tomatoes in his burger. The choice of soup of the day was minestrone or squash soup. 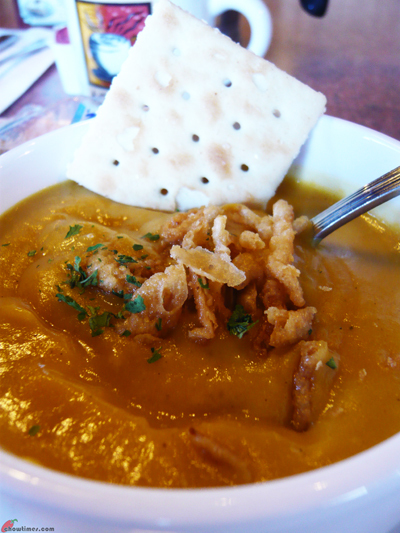 I opted for the squash soup which was creamy, sweetish and thick. A little too thick in my opinion. The server seemed to read my mind as he asked me if I wanted my pie to go. 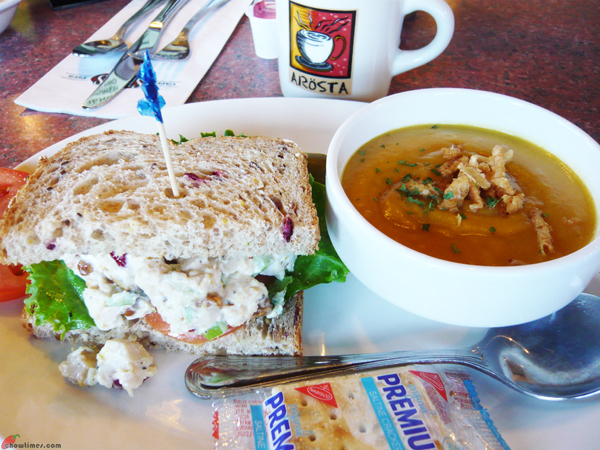 The sandwich and soup were more than enough for me. 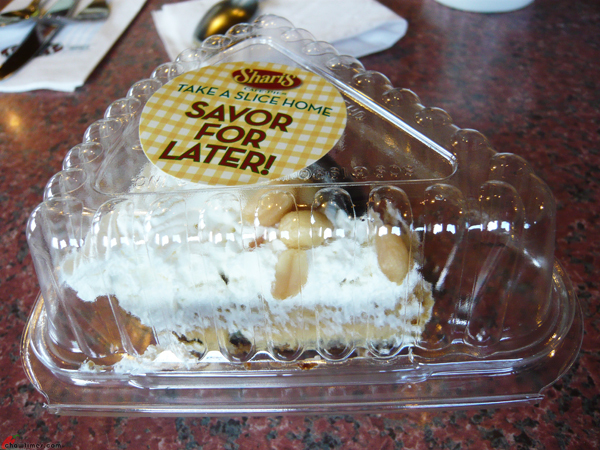 I had a slice of the Peanut Butter Chocolate Silk Pie to bring home for Arkensen since he did not come with us. One thing about most of the pie here is there is always a thick layer of cream on top which I try to avoid. Can’t eat that much of fatty food anymore at my age. For drinks, Ben and I had their brewed coffee while Nanzaro had an iced mocha. Ben commented that their coffee is not as good as it used to be. The bill came close to $40 before tips. Ben has to adjust to the more expensive meal in North America now and he has to calculate how much tips to pay. Welcome home, Ben. Welcome back Ben! 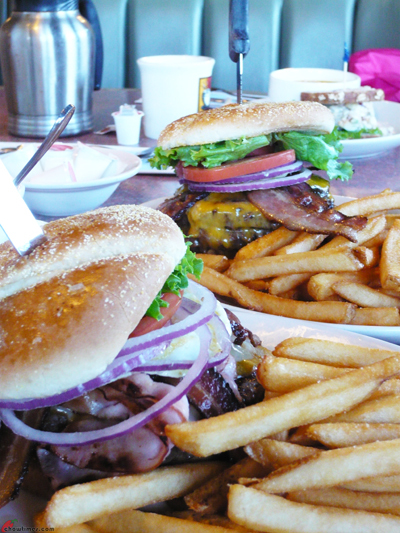 I did not know that Shari’s had such fine looking burgers. I’ve always thought of it more like a denny’s. The fried egg really gets engines revving! @Dylan: in China, McD deliver food to you ?!? Yeah, LotusRapper. They have delivery for almost everything … and super efficient too. They all go around in motorbikes. Their version of Amazon is so efficient that you could order something in the morning and they will deliver it to you and collect cash for payment. You can even order groceries. Wow amazing indeed. One notch past drive-thru, I guess. Can’t imagine all that motorized delivery service is good for keeping greenhouse gases at bay (not that all other aspects of China’s economy are neither). Environmentally-friendly mopeds with insulated carriers mounted on the back! Double cheeseburger, chicken wings, and a large Coke, 4 in the morning. Then, when you wake up, call the shop on the corner to bring you Snickers, a pack of Camel Blues and Vitamin Water. Well if in Beijing, don’t even need the pack of Camel …… just step out to the street and take a looooong whiff ! My first burger in Canada is always the Vera’s at YVR. Vera burger with provolone and Dijon. But I eat too many burgers in China, anyways– 24 hour McDonald’s delivery is addictive. A shame I didn’t get a chance to run into you in the Motherland, Ben. Are you going to be in Vancouver for a while? Was the burgers very good? I like that they asked Nanzaro if he wanted his burger patties pink. Apparently there’s a special sauce with The Trail Boss Burger? What’s the special sauce? Welcome back, Ben! Hmm I might try this place the next time I visit Bellingham. Wow, I’d hammer a burger like that. Looks delicious.